Embre & Alexis got engaged on August 27, 2016. This was a very special day for a couple of reasons: first, it was mine and my husband's 7th year anniversary since we began dating and secondly, because my college classmate was ready to declare his love for his then, girlfriend, and ask her to marry him in front of their family and friends. That night, Alexis thought she was attending the Jill Scott concert that was in town in Columbia, SC. She did not know that her boyfriend, parents, sister, best friend, and a host of other relatives and friends (including me) were planning to surprise her alongside Embre. We all met up at the Vista Room at the Blue Marlin in Columbia's Vista. There, all the guests waited patiently for Alexis and her sister, Amy to walk up to the sidewalk and past the sliding green door, where she would find Embre as he got down on one knee. The surprise proposal was a success! 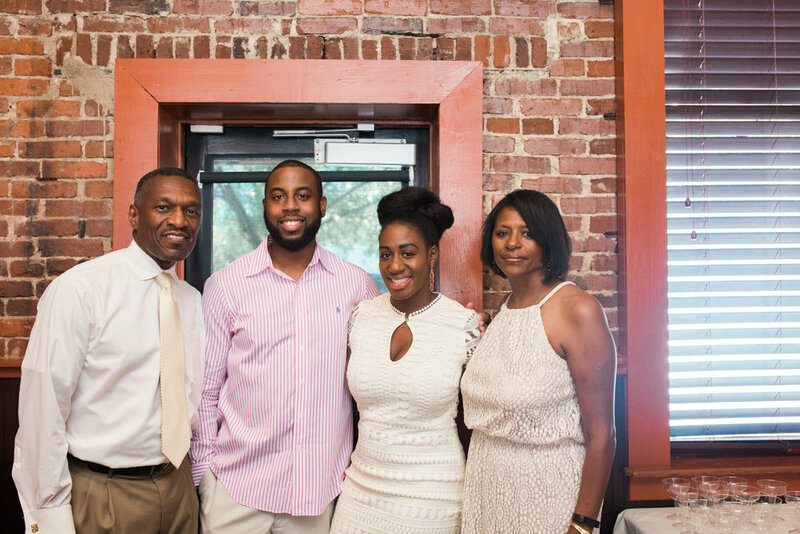 Alexis said "YES" and with family and friend surrounding them, Embre & Alexis began the next phase of their lives. For as long as I've known Embre, he's been a hard worker, a loyal friend, and very kind-hearted. I can only imagine how happy he has and will continue to make Alexis happy as her future husband. Please join me in congratulating the two of them!